What happened to Whoopi Goldberg's eyebrows? There is a spot there where I know they should be, and yet they are not... I've literally been thinking about this, on and off again, for years... Which also goes to show that I, clearly, have too much time on my hands. 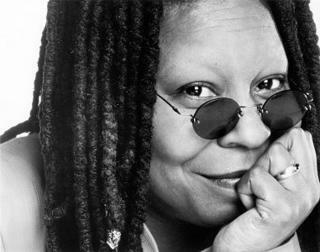 Who spends years thinking about Whoopi Goldberg's eyebrows, or lack there of? Apparently if you watch Whoopi's early films, she totally has eyebrows. Apparently she didn't like her eyebrows, so she had them surgically removed. What's truly weird is that it seems like she can pull the look off.. Case in point, I never really noticed until you pointed it out.